Recently we brought you a story about Renault-Nissan planning to increase production capacity from 2 to 4 lakhs after Sunny exports begin. Now this is just a part of the story as many other global giants are also willing to adopt a similar strategy. 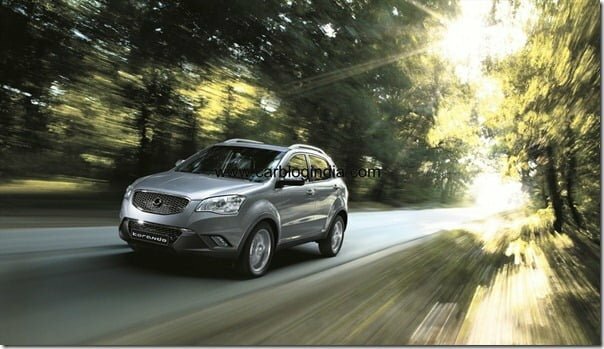 Ssangyong, a Mahindra & Mahindra owned Korean automobile manufacturer, is yet to launch its two major SUVs, Ssangyong Rexton and Ssangyong Korando, and it is being said that the same could opt India as its next major manufacturing and export hub. This news is considered to be a part of the aggressive future expansion plans that Ssangyong has in mind that also includes investments of billions of dollars on new product development over the next couple of years. Later this year the company will launch the cars and will start assembling them here and it is also in talks with local vendors for supply of parts in order to further bring down the costs. Now the catch is that if Ssangyong likes the quality delivered by local suppliers, also being adopted for the XUV500, it might create India as its export hub. India is one of the emerging markets in terms of consumption and the one important factor that draws the attention of global majors is the availability of high quality labour at cheaper wages and also lower manufacturing costs. Ford and Maruti Suzuki export an appreciable number of vehicles to international markets annually and now that even Ssangyong is considering India as the next export hub we could see other remaining majors to follow a similar strategy as well.